Definition: As it is evident from the name, cost of capital refers to the weighted average cost of various capital components, i.e. sources of finance, employed by the firm such as equity, preference or debt. In finer terms, it is the rate of return, that must be received by the firm on its investment projects, to attract investors for investing capital in the firm and to maintain its market value. Corresponding payment for using finance. On raising funds from the market, from various sources, the firm has to pay some additional amount, apart from the principal itself. The additional amount is nothing but the cost of using the capital, i.e. cost of capital which is either paid in lump sum or at periodic intervals. Explicit cost of capital: It is the cost of capital in which firm’s cash outflow is oriented towards utilisation of capital which is evident, such as payment of dividend to the shareholders, interest to the debenture holders, etc. Implicit cost of capital: It does not involve any cash outflow, but it denotes the opportunity foregone while opting for another alternative opportunity. To cover the cost of raising funds from the market, cost of capital must be obtained. It helps in assessing firm’s new projects because it is the minimum return expected by the shareholders, lenders and debtholders for supplying capital to the business, as a consideration for their share in the total capital. Hence, it establishes a benchmark, which must be met out by the project. However, if a firm is incapable of reaping the expected rate of return, the value of shares in the market will tend to decline, which will lead to the reduction in the wealth of the shareholders as a whole. It helps in evaluating the investment options, by converting the future cash flows of the investment avenues into present value by discounting it. It is helpful in capital budgeting decisions regarding the sources of finance used by the company. 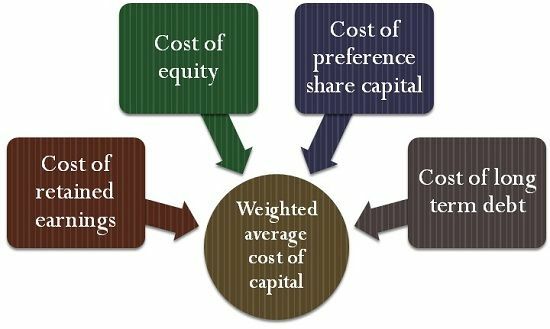 It is vital in designing the optimal capital structure of the firm, wherein the firm’s value is maximum, and the cost of capital is minimum. It can also be used to appraise the performance of specific projects by comparing the performance against the cost of capital. It is useful in framing optimum credit policy, i.e. at the time of deciding credit period to be allowed to the customers or debtors, it should be compared with the cost of allowing credit period. Cost of capital is also termed as cut-off rate, the minimum rate of return, or hurdle rate.